The League of Moveable Type offers free & open-source, @font-face ready fonts. The catalog consists of 16 high quality fonts that may be used in your print material or on your website. UrbanFonts.com Provides over 8,000 freeware fonts for download, categorized alphabetically and by type. The site also features a top 100, what's new and featured font area as well as a font blog. FFonts.net An excellent freeware font resource and directory with thousands of high quality fonts available for download. 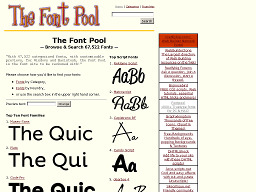 The site is easy to navigate and provides a good overview of each font type. SearchFreeFonts.com SearchFreeFonts.com offers over 7,000 free fonts and 19,000 commercial fonts. 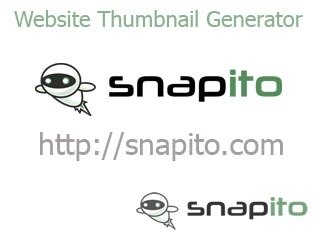 The site also provides useful tools, links and articles. Font Connection A fantastic source for freeware Windows and Mac fonts. If you want to spruce up your website with some unique font faces, this is a good place to start. Hundreds of styles to choose from. 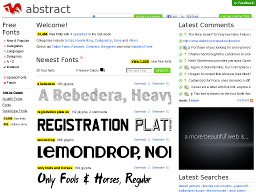 AbstractFonts AbstractFonts is a free font site. Hundreds of fonts to choose from, nicely organized into categories. If you need some unique fonts for your graphic creations or web pages, this site is a good starting point. Acid Fonts Acid Fonts is a must visit. Fonts are nicely displayed, arranged alphabetically and all are downloadable. Thousands to choose from. The Font Pool Has more than 18,000 categorised Windows and Mac fonts with customizable previews. If you're looking for that perfect font, this is the site to visit. FontFreak Bills itself as the largest free-/shareware font archive on the net with fonts from over 300 different authors. 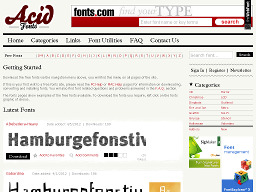 Choose from thousands of PC and Mac fonts. HighFonts.com A highly rated font site with over 3,200 fr'ee fonts and 11,800 commercial fonts. Also carries links to other top font sites. ThemeWorld As the name suggests, focuses on Desktop Themes, but the reason we selected this site is because it has an outstanding Fonts area with over 2,700 fonts nicely organized by type and style. But if you're not interested in fonts, then check out the 6,300+ themes, 1,900+ screensavers or 2,200+ wallpaper selections. 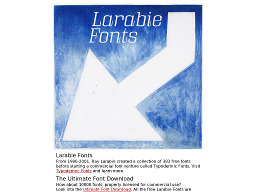 LarabieFonts.com Offers a small collection of commercial fonts and a fairly large collection of freeware fonts for both Mac and Windows systems. The site has a number of fonts not found on other font sites. 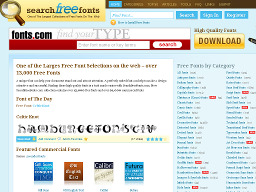 Fonts.com The Net's number one font resource. 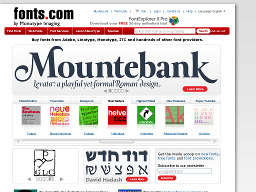 Find fonts for preview, purchase and immediate download. 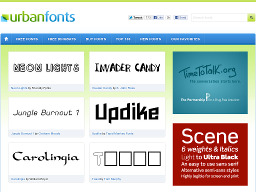 If you're looking for a wide variety of professional fonts, Fonts.com is a must visit. The site also offers the latest typographic news, tips, and typeface releases.